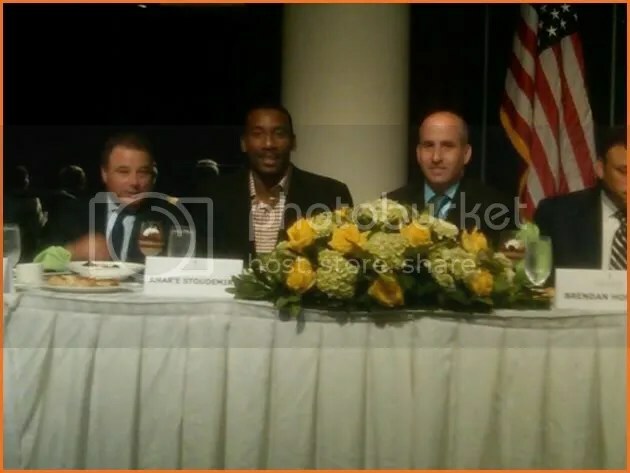 Today Amar’e Stoudemire was one of five men who accepted their 2011 “Father of the Year” award from the National Father’s Day Council. The other four men awarded were Syracuse basketball coach Jim Boeheim, CEO of the Harlem Children’s Zone Geoffrey Canada, President of Lord and Taylor’s Brendan Hoffman and AT&T chairman Randall Stephenson. All five men accepted their awards today at the Sheridan Hotel on 811 Seventh Avenue at 52nd street. Congrats to Amar’e who has thrived both on and off the court in New York City. He continues to prove his worth as a contributing member of society as a great and articulate man as well as a leader and role model for youth everywhere.